What's New in this Lightroom Release > Lightroom Classic Updates > What’s New in Lightroom Classic CC 8.1 (December 2018)? 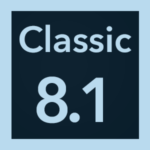 Lightroom Classic CC 8.1 has been released today. As well as performance improvements, bug fixes and new camera/lens support, the engineering team have spent this release cycle focusing on some long-term requests. 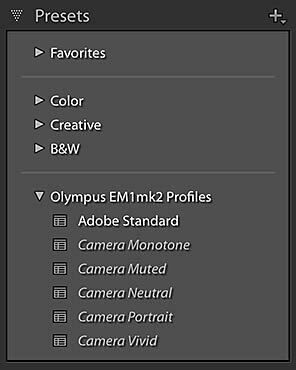 The entire Lightroom CC ecosystem has also been updated. By popular demand, you can now rearrange the order of the Develop module panels to suit your own workflow. For example, if you always use the Detail panel last for improved interactive performance, you might want to move that to the end. To do so, right-click on the header of a right-hand Develop panel and select Customize Develop Panel. Drag the panels into the order of your choice, then restart Lightroom to apply the change. When moving image or text cells in a book, you can now turn on Guides panel > Grid Snap (also called Snap to Grid) to accurately align cells to the background grid or other cells. When Adobe released the updated preset mechanism in April 2018, they introduced some degree of confusion. Develop presets can apply profiles, but not all profiles are applicable to every file type. For example, there’s no Adobe Color profile for JPEG’s, and you can’t apply Olympus raw profiles to iPhone images. Rather than applying the preset and just skipping the profile, Adobe chose to hide presets that were only partially compatible for the selected photo, causing many photographers to wonder where their presets had gone. You can now check Preferences > Presets tab > Show Partially Compatible Develop Presets. With this checked, the partially compatible presets display in the Presets panel as italic/dimmed text, and can be applied to any photo, as they could in earlier Lightroom versions. When creating a new preset, if you type the name of an existing preset in the same group, Lightroom now asks whether to replace the existing preset, duplicate the name (bad idea, as you end up with two different presets with the same name) or rename the new preset. Have you ever hit the Quit Lightroom shortcut by accident, or immediately changed your mind? There’s a new Do you really want to quit? dialog for these occasions, but if you don’t want to see it, you can just click Don’t Show Again. When Photo Merge was introduced, it required identical dimensions, focal length and orientation. These limitations have now been removed. The single-step HDR/Panorama merge introduced in the October 2018 release now also works on smart previews if the originals are offline/ missing. To allow easier comparison between the different merge options, the previews are now cached, so you can switch back and forth faster. When using Auto Import to automatically import photos dropped into a watched folder, you can now automatically add the photos to a collection. You can now apply a color label to a folder even if the folder is offline/missing. You can now migrate Photoshop Elements 2019 catalogs. No new tethering in this release. If you find another bug, click here to learn how to report it to Adobe. The eBooks for Adobe Lightroom Classic – The Missing FAQ are already updated for these changes, and can be downloaded immediately after purchasing. If you’re already a Classic Premium Member, the updated eBooks are available for download in your Members Area. 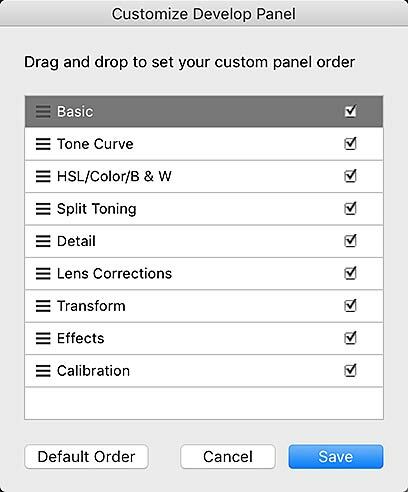 Customize Develop Panel Order = it is about time. A welcome change. What a shame us non-subscription users cannot get these updates. Customise develop panel order should been introduced years ago. Yes it is overdue. 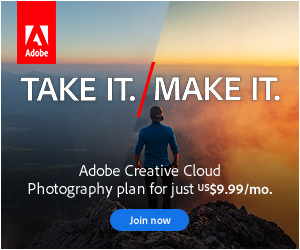 However based on the timing of it’s even if Adobe had continued perpetual licensing you still would have had to pay for the updates to get it. I started with LR5 and after LR6 was announced I stopped getting updates until I purchased LR6. I purchased DXO PL, 6 months later they introduced a new version and now I won’t get updates unless I pay for the upgrade. That won’t happen – not after 6 months. Customize Develop Panel order will save me hours and missed modifications. For example, as an architectural photographer, I always use the crop overlay in combination with Transform. Crop was at the very top of the panel and Transform almost at the bottom. It was a real hassle to always have to move back and forth for every finished photo. I now have the directly next to each other. Now if the LR team will only fix the crop sizes to allow unlimited sizes with custom naming and size deleting. PLEASE! Keyboard shortcuts can be used to jump to any panel, even if it’s not in view. Cmd-7 (Mac) or Ctrl-7 (PC) are the shortcuts for the Transform panel in the default order. If you change the order of the panels in LR 8.1, then the shortcut numbers will change to reflect the new order. A list of keyboard shortcuts is dry reading, but you might find other major timesavers there. I agree that more control over the aspect ratio menu would be really helpful for those using custom ratios. click on help/updates in LR 8.0 and LR CC app loads and it says no updates. exit LR CC app and reload it and it still says no updates…. Guess I’ll just have to wait my turn!!!! Same thing happened to me. I quit the App Installer, opened it and then it worked. It’s a folder on your hard drive that Lightroom watches to see when you add new photos, so it can import them. It would usually be used by someone tethering their camera using other software. Adobe did a good job with this update – judging by the list of new stuff. However, I must commend VB and her crew for their good work. Thanks so much. These updates via your newsletter and articles are very useful and welcome. It’s a shame adobe haven’t yet sorted out the green cast that occurs when XT-3 try to amend the white balance using the drop down menu. This occurs in both lightroom and camera raw, not a problem I have with the XT-2. I understand that adobe technicians started working on this as soon as the new version of lightroom classic was released. Any idea when this will be accomplished? It’s very frustrating. I just found a strage behaviour when trying to export 2 images out of Lightroom (as separate layers) into Photoshop. I wanted to do some focus stacking with my two images but I does not longer work. After the export I cannot work with the two layers as most of the commands in photoshop are greyed out and I cannot choose the necessary commands to auto align the layers and to combine them. This worked with the previous versions of Lightroom but there seems to be a problem with the latest Lightroom version. I nevertheless found some trick which still works (export each photo separately to photoshop and combine those two exported images via copy/paste). Then the layers can be aligned and also the other process steps work without problems. Of course it’s RAW format DNG layers (each image is an HDR created in Lightroom). I already used the same function several times this year without any issues (of course with an older Lightroom and Photoshop versions). There is a bug in the latest Photoshop release that causes all the commands to be greyed out. The workaround is to open Photoshop before Lightroom, or turn off Photoshop’s Home screen. This may be a different issue, but it’s an easy one to rule out. I uninstalled the 2019 version and am now using 2018 version successfully – again. Adobe are |I believe aware of the greyed out problem, working on it, and I am waiting foe the next update to Photoshop to see if this has been remedied. I can’t seem to find it now that I’ve done it. Not just that dialog, but Preferences > General tab > Reset all warning dialogs will bring back any you’ve chosen to not show again. I’m using LR5. I recently purchased a new DELL XPS to improve my Photography flow. Intel i-7, 8G RAM 3.2GHz. My flow all came to a screeching halt! FIRST- I can’t find folders after I initially make adjustment then go to another folder and try to come back to the previous folder. Even if I find them under “Past Month” or some other heading I can see them but it gives a message at the top of the photo which reads “the folder can not be found”. WILL NOT RE-OPEN FOLDERS. SECOND- ERASE button DOES NOT WORK on ADJUSTMENT BRUSH. If I brush an area and need to clean up an area where I brushed over too far I can’t turn on ERASE and clean up the edge. THIRD- When I go back to photo’s already edited, It looks like someone has put little SPOT REMOVAL EDITS in random places. FOURTH- After editing for a short while BRUSH and SPOT TOOL STOPS WORKING and I have to CLOSE LR and re-open to continue. Does my camera make a difference? Does my OS make a difference? 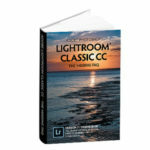 This is a discussion about Lightroom Classic 8.1, and it sounds like you’re having a lot of LR5 issues that need investigating, so post it on the forum at https://www.lightroomqueen.com/community/ so we can help you unravel it all. I cannot understand why they would bring out an update to support the Nikon Z7 back in October but still no support for its tethered capture. Tethering is usually added later than camera support. That’s often caused by having to wait for the camera manufacturer (e.g. Nikon) to release the tethering SDK, which is usually later than the camera release date. In this case, Nikon added support to the tether SDK on 28 November, so too late to get into the December release. OK. Thanks – so shouldn’t be too long to wait then. That “Do you really want to quit?” pop up threw me for a loop. I spent ten minutes searching to find out why the standard exit box was replaced. Of course, I found nothing because it hasn’t been replaced. It’s right behind the ‘Do you really want to quit’ box. p.s. I hope there is a way to disable that silly box. Yep, there’s a Don’t Show Again checkbox in that dialog. New version doesn’t have the “ask before backing up catalog” any more. It’s kind of all or nothing now. I would like to have the option to back up or not each time I quit. I had the previous version set to ask me if I wanted a back up each time I quit. It should still be there, right after the “do you want to quit?” dialog. Go to Catalog Settings and make sure it’s still set to ask you to back up when you quiet.